BASF's Deoxo catalytic ozone (O3) converters have been reducing harmful pollution inside aircraft cabins for over 30 years. In 2004, BASF introduced a dual O3/Volatile Organic Compound (VOC) converter (see Figure 1) that works directly with the environmental control system to reduce jet fuel odors in the cabin, enhance passenger comfort throughout the plane, and improve passenger perception of air quality. An olfactory study by the Fraunhofer Institute showed a 40% improvement in the perceived odor intensity with a 60% increase in the perceived air quality with use of BASF's dual O3/VOC converter. ​For over 30 years, BASF has supplied Deoxo ozone converters to airlines and aircraft manufacturers to help combat air pollutants within the aircraft. The Deoxo converter removes ozone from the cabin air by catalytically converting it into oxygen. In addition, BASF offers Deoxo ozone/VOC converter technology, which reduces unpleasant smells that are generally associated with Volatile Organic Compounds (VOC) generated by aircraft engine exhaust, thus making for a safer and pleasant aircraft cabin flight experience. For many decades, aircrafts have been flying at higher altitude in order to reduce fuel consumption. However, at these levels, the ambient O3 concentration becomes an unavoidable contaminant. Typically, O3 enters the aircraft though the air conditioning system. Once on-board, O3 causes fatigue (jet lag), headaches, shortness of breath, nausea (air sickness), sinus irritation, as well as chest pains and pulmonary distress. Because of these adverse health effects, the Federal Aviation Administration (FAA) set limits for O3 content in cabin air in 1981. According to FAA AC-120-38*, O3 must be less than 0.25 parts per million by volume (ppmv) at any given instant above 32,000 feet (FL-320). Above 27,000 feet (FL-270) for each flight segment that exceeds 4 hours, the time weighted average amount of O3 must be less than 0.1 ppmv. ​Other sources that can create foul and unpleasant odors in cabin air are VOCs. VOCs can come from chemicals necessary for maintaining aircraft safety, such as hydraulic fluids, engine lubricants, jet fuels, and de-icing fluids. These smells are most prevalent in the cabin during taxiing, take-off, and landing. Currently, no federal regulations exist for VOC removal. ​Catalytic ozone converters work by oxidizing the contaminant. They consist of a metal housing for a precious metal catalyst, which is selected based upon the toxin to be removed. They have excellent durability, superior lifetime, and cost-effective maintenance. However, while effective, traditional converters only target the ozone in the aircraft. Since 1980, BASF has been the leading supplier of catalytic ozone removal systems for Boeing, Airbus, Gulfstream, McDonnell Douglas, and several other aircraft lines. Their traditional converters are installed on Airbus A300-A320, A330, A340, Boeing 747, 757, 767, Douglas DC10, MD11, and other regional and corporate jet configurations. With the increasing regulation of VOC-issues, BASF recognized the need for innovation. After years of research, BASF developed and patented a specially-enhanced catalyst washcoat. To convert both O3 and VOC during on-ground and in-flight operations, BASF added their washcoat to the traditional O3 converter to produce the Deoxo dual O3/VOC converter. 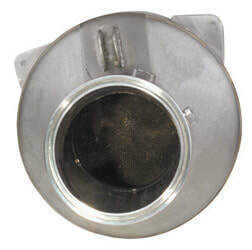 This converter removes VOCs coming from the bleed air system and incoming fumes from other aircrafts and airport vehicles. BASF's Deoxo dual O3/VOC converter is a viable economical choice because it has no effect on pressure drop, is fully interchangeable, and is easily retrofitted to replace a previously installed single ozone converter. In 2002, the Fraunhofer Institute conducted an olfactory experiment using BASF's Deoxo dual O3/VOC converter on VOCs generated by the jet fuel of a JP1. As seen in the results given in Table 1, the pleasantness or the hedonic tone of the odor improved. Panel members described the odor in the air upstream, before contact with the catalyst, as "a little unpleasant". Downstream, after the air came into contact with the catalyst and exited the dual converter, the tone was upgraded to "slightly pleasant". The odor intensity had a 40% improvement while the acceptability generated a 60% enhancement. Using a flame ionization detector (FID), the total hydrocarbon (THC) indicated a 20% improvement with the catalyst in place. Overall, BASF's Deoxo dual O3/VOC converter produced a distinct advancement in cabin air quality. Using these conventional methods can induce negative ramifications. In thermal decomposition, the energy used is so extensive that any fuel savings from altitude adjustment is rendered useless. The accumulation of particles on the adsorbent decreases the efficiency of carbon adsorption filters, which leads to costly filter maintenance or replacement. The reactor in non-thermal plasma oxidation contains O3; therefore, a compromise between the required electrical power and the O3 generated must be reached. Also, if the VOCs are neither hydrogen- or carbon-based, non-thermal plasma oxidation may produce toxic substances, such as hydrochloric acid. BASF's single O3 and Deoxo dual O3/VOC converters offer superior performance when compared to these traditional technologies. While BASF addresses the existing issues with their Deoxo dual O3/VOC converter, BASF also looks to the future. Currently, BASF is developing new technologies, including catalysts that operate at lower temperatures, lighter substrate materials, and improved converter design for enhanced mass transfer operations. BASF is dedicated to fulfilling the needs of the aerospace industry with products and services that increase health, safety, comfort, and economy. At BASF, we create chemistry. For more information about the full line of aerospace innovations, please contact us.